Here’s an update on Farthing – and some new ideas. 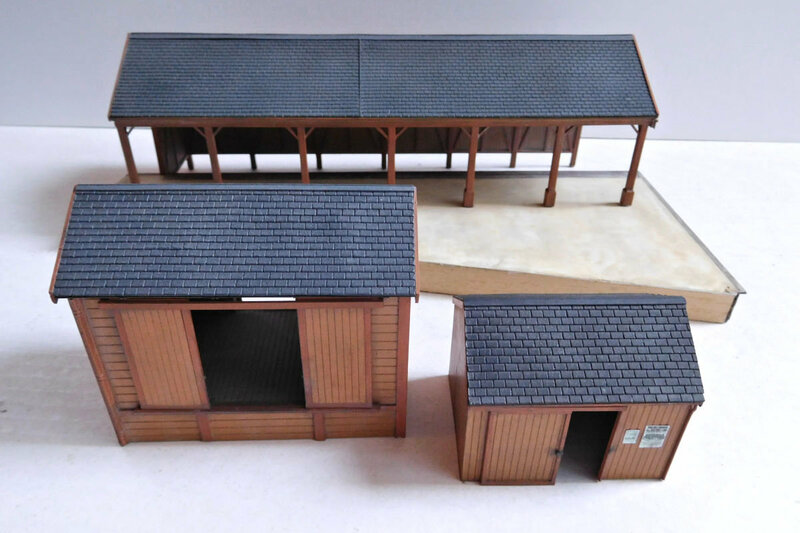 The “biscuit” and “jam” sheds have been painted and are ready to embed on the layout. The buildings are an attempt to hint at the past railway history of the area. They were originally built for the old N&SJR terminus at Farthing, which was alongside the Great Western station. When the GWR swallowed up the N&SJR, it kept the buildings and used them as loading and distribution facilities for the town’s booming industries. This backstory to the buildings is inspired by Witney and Stratford on Avon, where early passenger stations were also redeployed as goods facilities, for blankets and beer respectively. End view of the biscuit shed (not yet embedded). The track and chairs have finally been painted. I’ve tried to capture the effect of disappearing sleepers, but it hasn’t worked quite as I hoped. I’ve decided to live with it, but I won’t use this method again. What you see above is two layouts positioned next to each other, with the backscenes removed. 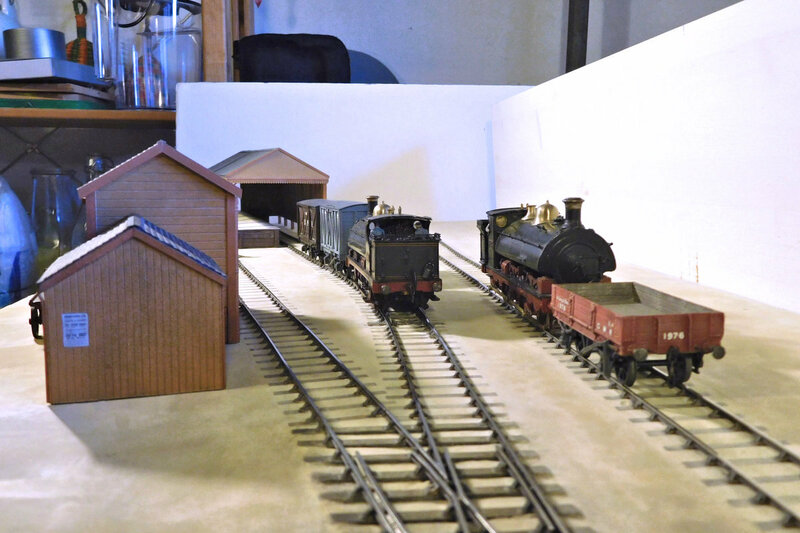 The current “sidings” layout is in the foreground, and the goods depot layout is behind it. The concept for Farthing has always been to build different parts of the same station on separate, self-contained layouts. But I must admit that this little experiment has whetted my appetite for joining the layouts together, in modular fashion. 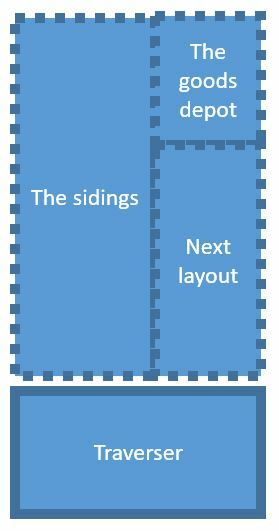 With such an approach, each layout would still be self-contained, but could then also be joined to form a larger layout. It wouldn't require much remedial work. The traverser could be moved to the right hand end of the sidings (nearest the camera), and the track extended accordingly, perhaps with an extra point or two for operational interest. A future module could fill the “gap” on the right. The whole thing would fit on my writing desk. Let’s see. For the time being I’ll finish one end of the sidings as planned, and then make some decisions. What a good move, Mikkel. The sense of space and depth is excellent and the effect is that of the natural spaciousness of your average railway yard. Lovely balance of colour and texture Mikkel. I think you've got something there! I like the first photo in particular. Just needs a few gas yard lamps, a horse and dray and a crane! Or maybe an old transshipment shed? I agree Mikkle, tear it down! Very interesting and clever idea. it seems to work quite well although I am not sure how the traverser works at the front, unless I have missed something. I am watching the whole modular thing with interest. For much of my professional life I have been wittering on about "access for the purpose of maintenance". So building things as modules makes good sense, not only can you get at the module from all angles to build it, you can also get in to clean and maintain it. Really, I look at some layouts and wonder how they even get at them to do the dusting. Great idea, as others have said, the added depth makes one heck of a difference. Something that may be a fun challenge might be to make the new (currently missing) module able to work both as you have shown, but with the option to also allow all the parts to join together end-to-end? Then you could configure the layout according to the space available and vary the operating? Glad you think so. I suppose the flow and alignment of the track isn't quite prototypical, but maybe a carefully positioned building or two could help disguise that. Lovely balance of colour and texture Mikkel. I think you've got something there! I like the first photo in particular. Just needs a few gas yard lamps, a horse and dray and a crane! Or maybe an old transshipment shed? Great ideas! 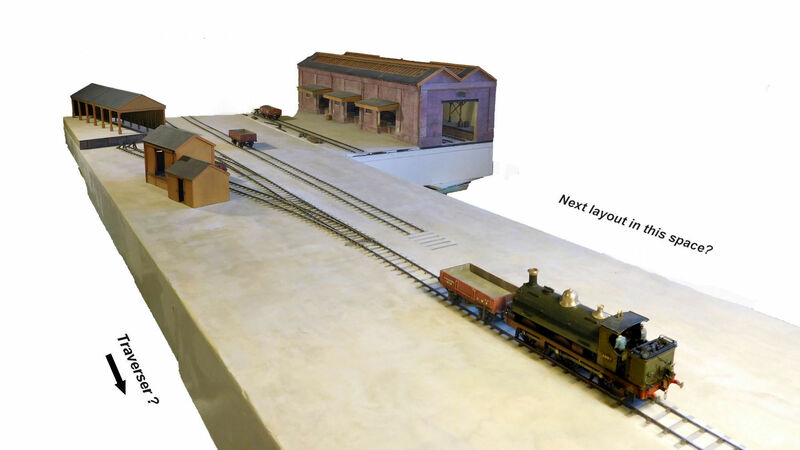 The gas lamps would help a lot, and there are two very appealing photos of the old transshipment shed at Reading that would make an interesting model. 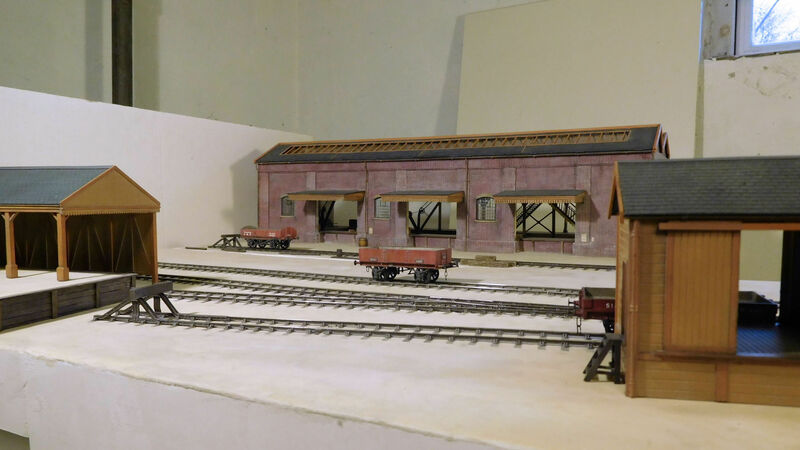 Other buildings I'm considering are a stable block, and this very modellable (I think) warehouse at Hockley. I agree Mikkle, tear it down! Looks lovely mate. Kind regards, Nick. Thanks Nick. I'm really warming to the idea. I've always thought of small layouts/micros as necessarily narrow, but I now realize that it doesn't have to be like that if there is room on a writing desk or similar. 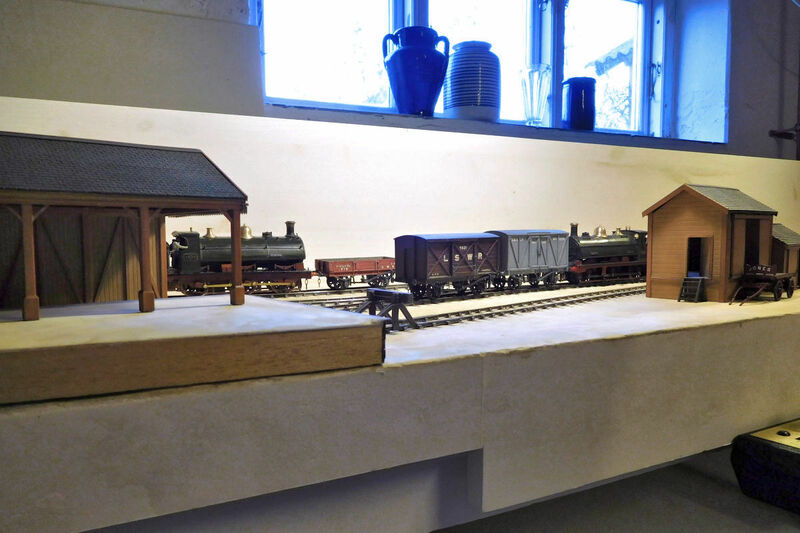 Thanks Chris, the entry to the sidings layout is currently from the left hand end (away from the camera in that last pic above). With this arrangement I would instead have the entry at the right hand end, nearest the camera. I've tried to sketch it below. It would require some extension of the current sidings to reach the traverser. 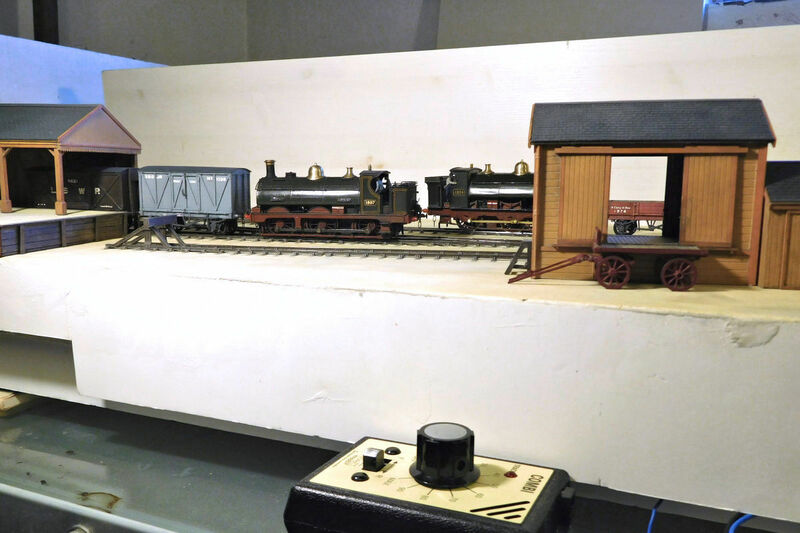 The traverser does not have to be very long, as it would be part of the shunting challenge that it could only hold the loco and a few wagons at a time. I agree Dave, one big advantage of the modular approach is that each section is manageable. I also feel it helps increase motivation because you can see a partially finished result within a reasonable timeframe. As for green and red engines, one thing I've found is that using polished brass fittings (rather than painted brass) really does make a huge difference on models of GWR engines. That said, I think the Caley had some pretty good looking engines too! I confess that i had always thought that the long-term plan was to bring all your individual 'bites of the elephant' together at some stage. 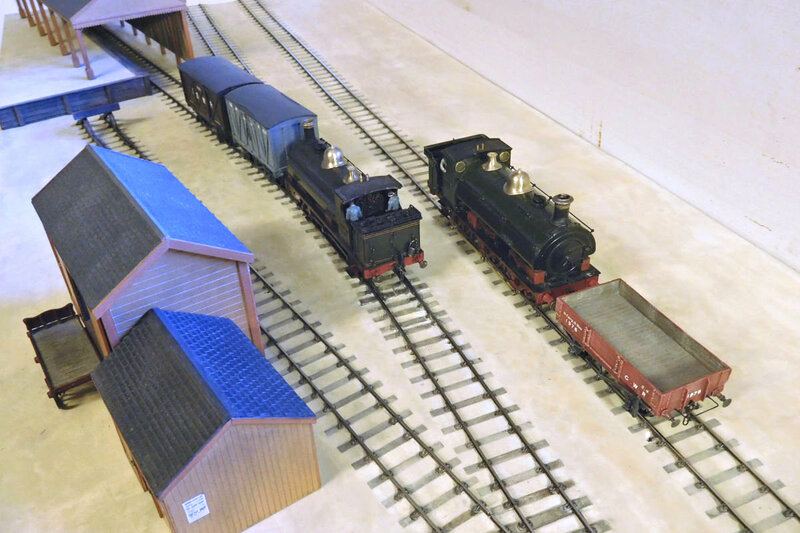 There are, of course, modular schemes, which allow different members' layouts to be connected together for club meetings. All it needs is a standard specification for the tracks at the edges of each module. Even if you never have the space to lay it all out in practice, you could plan accordingly and then, in many years to come, it could all be installed in the Mikkel Memorial Hall. Although it gives another dimension and a good perspectiv, I personally liked your goods depot as a separate diorama. I als liked the idea of building a larger station in separate smaller diorama’s (eating the elephant). A back ground gives a lot of depth, but personally I had chosen the back of a row of Victorian cottages or maybe even better http://www.warwickshirerailways.com/lms/lnwrf127a.htm showing a boundary wall of a factory. The yard also could provide coal merchants to serve the Farthing with coal. Looking forward to your choices and progress. Hi Job, the goods depot will still exist as a separate diorama when I want it (that is also how it has been stored for a while). 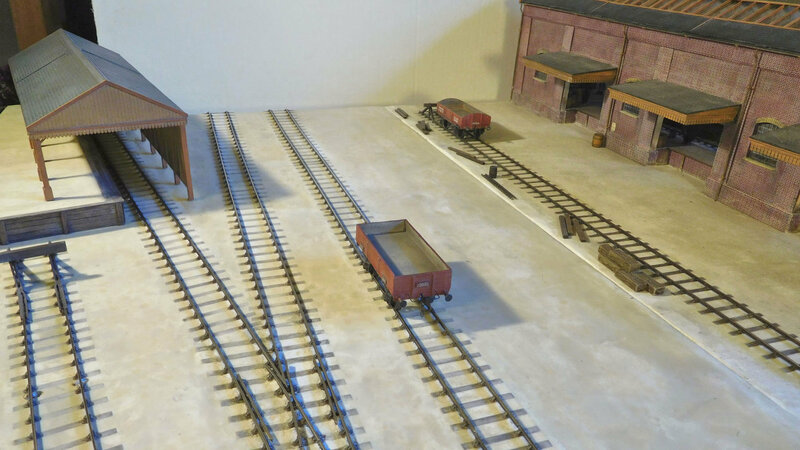 When the layouts are combined, there will have to be an outer wall to the goods depot, this can be fixed on a removeable backscene. 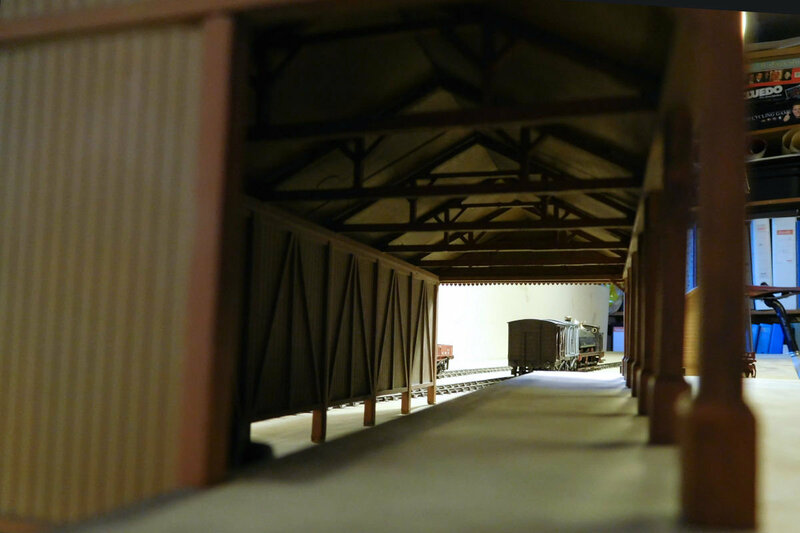 The combined layout can also be viewed from the alternative side, looking out through the goods depot. I can see your point about Victorian cottages or other features in the background, but what I like about the proposed arrangement is that it looks into the goods yard, rather than looking out towards its margins which is how we often model such scenes. Not a great choice, since it is only a temporary structure - I should think longer term, if I were you. It is, however, a decent size at 365m diameter (the number of days in a year). At 4mm scale, this represents 365000/4 feet diameter, or around 17 scale miles. That will enable you to model a good chunk of the landscape around Farthing. It should keep you busy for a fair while What was that about an elephant? Been thinking about layout depth today. I vaguely remember seeing a layout somewhere that was designed to be viewed end-on. Possibly in an MRJ a long time ago. Must investigate! I vaguely remember seeing a layout somewhere that was designed to be viewed end-on. Possibly in an MRJ a long time ago. Must investigate! Great idea Mikkel - love that depth created by the removal of the wall. Great idea Mikkel we rarely see a goods yard modelled to any depth yet plenty of goods yards spread out over a wide area. This does capture the feel of a major goods yard to me. Look forward to seeing it progress. Thanks Corbs, what a great video. The perspective modelling is so skilfully done. If I remember correctly Andy proposed an RMweb challenge using this approach a couple of years ago. I like the working roundy-roundy btw! I haven't found the MRJ layout I was thinking about. I wonder if I remember wrongly and it was in fact Steve Hall's "Halifax King's Cross" in No. 98/1997, which is a conventional longitudinal design but has some superb end-on views also. PS: Thanks for the likes on old blog entries - glad some of the older posts are of use, they do tend to get lost a bit and the menu/index is becoming too elaborate to use! Thanks Paul, very kind of you! I was just now looking at old photos of your Foster Street goods shed, as I remembered the access ramp with the cattle on it and am thinking of doing something similar. So far Farthing is a rather flat place! Hi Don, and happy new year! I'm really glad if you think there is a sense of a goods yard here. I suppose by some standards it should be even deeper to really capture the feel, but at least the layout can hint at it. The design of the goods depot is perhaps not ideal as it was not really built to be seen in a larger context, but there may be ways around that. I don't want to re-build things for this new purpose if I can avoid it, but some creative use of buildings and backscenes can hopefully help make it all blend together.